I know as much as anyone else, that a simple grilled chicken breast can sometimes border on drab. That's why I like to experiment with different spices, and cooking methods, to make the simplest of all diet meals, with the most flavor. I made this the other day, on an "I-hate-myself-for-not-having-visited-the-gym-in-over-a-week-day" - and it gave me a good excuse to put my new grill pan to test. 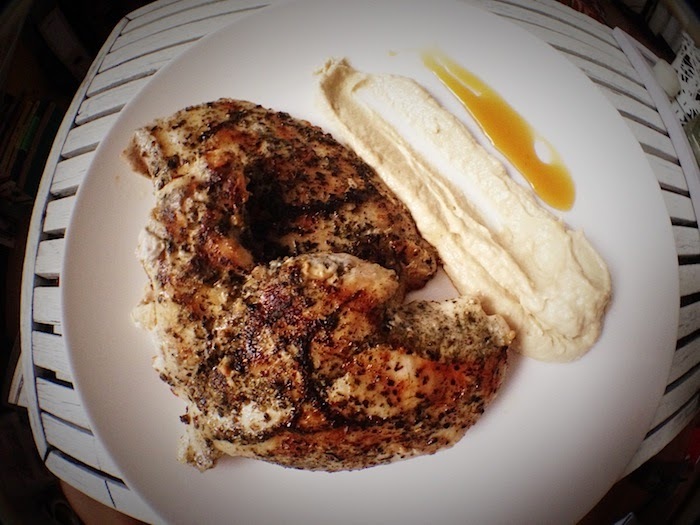 Rub chicken breasts with Worcestershire sauce, parsley, paprika, salt and pepper (marinade overnight if you have time). Put grill pan on low heat. Add a dash of extra virgin olive oil (optional). Add chicken to pan and cook slowly. Whip cream cheese into Dijon mustard, making sure the cream cheese is no longer in chunks but blends in. Measurements are more or less equal parts cream cheese to mustard. Cook chicken evenly on both sides until golden brown. Serve with the cream cheese mustard and some wild honey to garnish. I add the wild honey because I have probably been fine dining a little too much lately, and I'm finding every excuse in the book to mix unusual flavors. The trick is to keep it simple and keep trying different combos.. when it works, it just does. But again, this comes from the girl who likes to dip her french fries into her sundae. In my defense though, I think a great fig jam on cheese is the perfect appetizer. Okay, wow, all that just makes me sound weird.. but you have to try it!